Fluidic Verna,the all-new mid-size sedan of Hyundai was launched this year in India in the month of May.It is available in both petrol and diesel engine options.Hyundai offers the Verna with eight engine variants namely 1.4L Petrol/1.4L Diesel, 1.6L Petrol/1.6L Diesel, two SX 1.6L petrol/diesel version and two high-end variants with optional features.The petrol options are 1.4 VTVT with 107 horsepower and 1.6 VTVT with 123 horsepower.Diesel options include 1.4 CRDI with 90 horsepower and 1.6 CRDI producing 128 horsepower.The engine is mated to a five speed manual gearbox and a four speed automatic transmission is also available in the optional package.The standard features of Verna include LED turn indicators on outside mirrors, chrome front grille, door black out tapes, blue interior illumination, power windows, keyless entry, air conditioner, electrically adjustable out side rear view mirrors, driver information display, power steering with tilt function, front map lamps and four speaker MP3 player with AUX-in and USB.Safety features include front fog lamps, clutch lock system, central locking system and immobilizer.It is available in the price range of Rs.699,000 to Rs. 1,074,500. Hyundai Fluidic Verna is available in 15 variants. View below listing of variants based on their fuel type. Upcoming variants of Fluidic Verna are also listed here. * Prices of Hyundai Fluidic Verna car indicated here are ex-showroom price not the on road price of Fluidic Verna. Price list is subject to change and for the latest Hyundai Fluidic Verna India prices, submit your details at the booking form available at the top, so that our sales team will get back to you. Hyundai Fluidic Verna mileage mentioned here is based on ARAI test drive and not from Fluidic Verna review by vicky team. 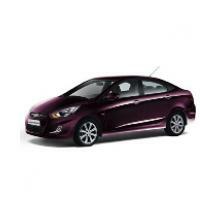 "The prime specs of Hyundai Fluidic Verna are listed here. The overall length, width of the car should give you an idea about parking space it require. The ground clearance (lowest part of the car to the ground) will give you the measure of water wading capability and confidence of Fluidic Verna's capability to run over potholes and speed breakers. However GC (ground clearance) won't tell everything. Other important factors like approach angle, breakover angle and departure angle is required to assess the cars' ability to run in rained indian roads and light off road tracks.Engine specs of Fluidic Verna are also listed here. With the power (in bhp) and torque (Nm) figures the most important ratios - power to weight ratio of Fluidic Verna and torque to weight ratio. The displacement (in cc) is the measure of cubic capacity of the engine. Earlier there was a notion, larger engines produce more power and torque however with the invention of advanced technologies this is no longer true."